Glitter decor comes on a very large spectrum. There is the type of glitter that look like it belongs somewhere on the Vegas Strip and then there is glitter that appears very elegant. Crushed glass glitter is definitely on the gorgeous side of the spectrum. My crushed glass glitter was purchased from Hobby Lobby and it took about 1 1/2 of the small jars to cover eighteen letters. Start out with whatever you are going to cover with the glitter. I purchased these letters from Hobby Lobby. They periodically go on sale for 40 percent off. If you are doing a saying with a lot of letters, it might be worth it to watch for the sale. Paint on Mod Podge to the surface of letters with a sponge brush and sprinkle with glitter. Make sure you have a thick enough base of glue for the type of glitter you are using. Crushed glass glitter is not fine and I did not use enough for my first letter "S". While I was putting the glitter on, one of the letters ended with a monochromatic ombre look I really like and would be fun to do. 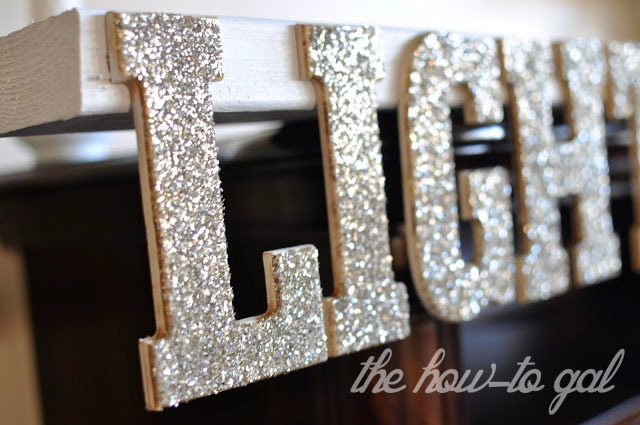 Once you have glittered all your letters, you need to seal the glitter to reduce flake off. If you want a more matte finish, use the Mod Podge. I wanted to keep it shiny and glossy, so I sealed it with a coat of polyurethane. Since my sign was going across two shelves, the letters needed to be attached to something substantial and heavy so there would be no chance of it falling over. I purchased a long piece of wood from Ace (around two dollars), cut it down to size and painted it white. Next, I figured out the layout of my letters with some masking tape. Once it was aesthetically pleasing, I applied hot glue to the back and attached. This would be a great project to add some sparkle to your home for the Holidays. P.S. Come visit me at the Bijou Market starting Friday! Sandra! 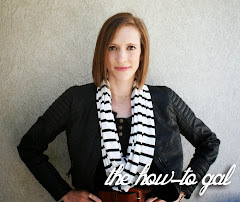 I am so glad to see your beautiful face on Anna Rose's blog!